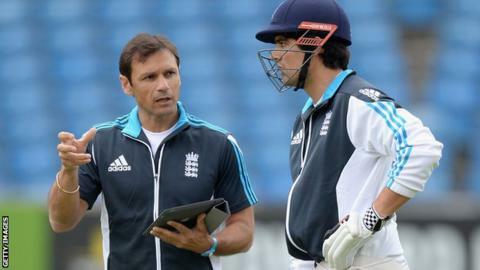 Former Middlesex and England batsman Mark Ramprakash has been confirmed as the new England batting coach. The 45-year-old, who retired in 2012, will work across all three formats of the game, beginning with a one-day tour of Sri Lanka later this month. He began working with the England team last May after periods with the England Lions in 2012-13 and succeeds Graham Gooch, who left the role last summer. Ramprakash played 52 Tests between 1991-2002, averaging 27.32. He played for Middlesex and Surrey, making 114 first-class centuries, two of which were at Test level, and said: "I will draw on my 25 years of experience as a cricketer but also am open to learning all the time. "I feel we have a very exciting group of players and am relishing the opportunity to continue working with them." Paul Downton, managing director of England Cricket, said: "Mark has formed excellent relationships with players and a strong partnership with Peter Moores and the management team. "I have no doubt he will continue to have a positive impact as we begin an exciting winter of cricket."